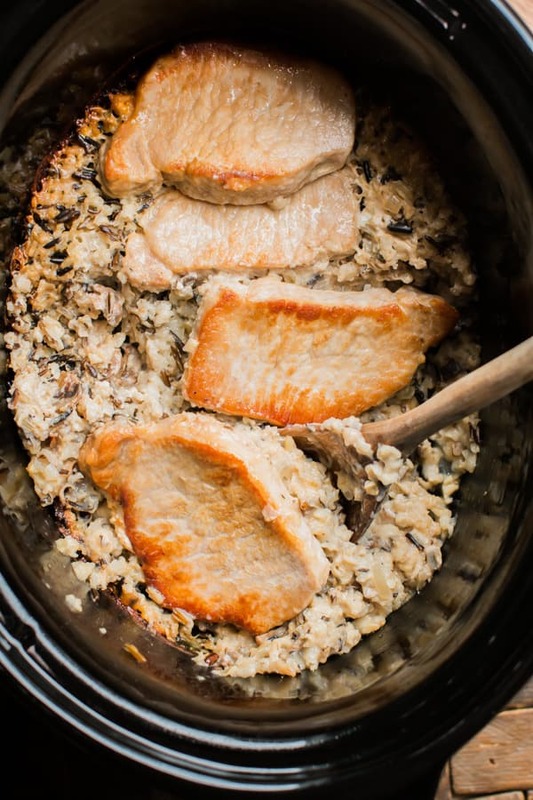 Slow Cooker Minnesota Pork Chops are tender chops in creamy brown and wild rice! 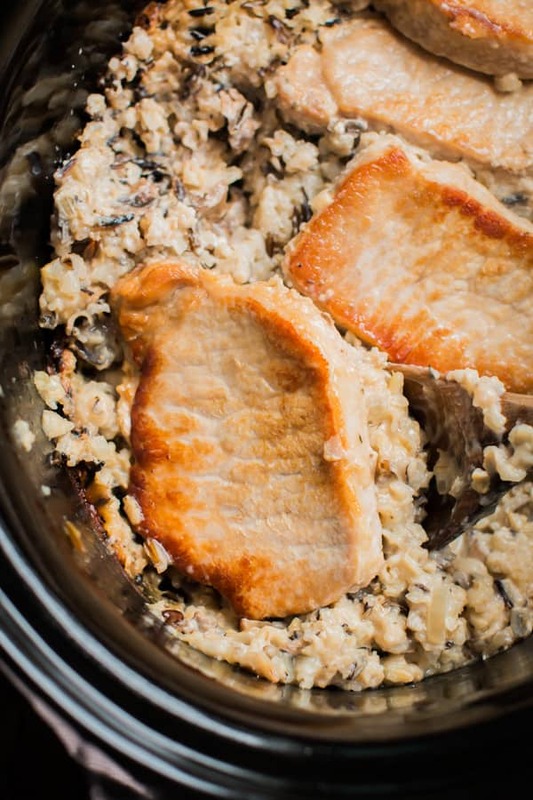 I saw this recipe for Minnesota Pork Chops on a friends blog Norine’s Nest. 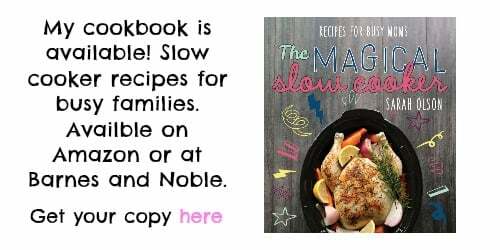 I knew the minute I saw this recipe I had to try it in the slow cooker. I am guessing this recipe is named Minnesota pork chops because wild rice is grown in Minnesota. 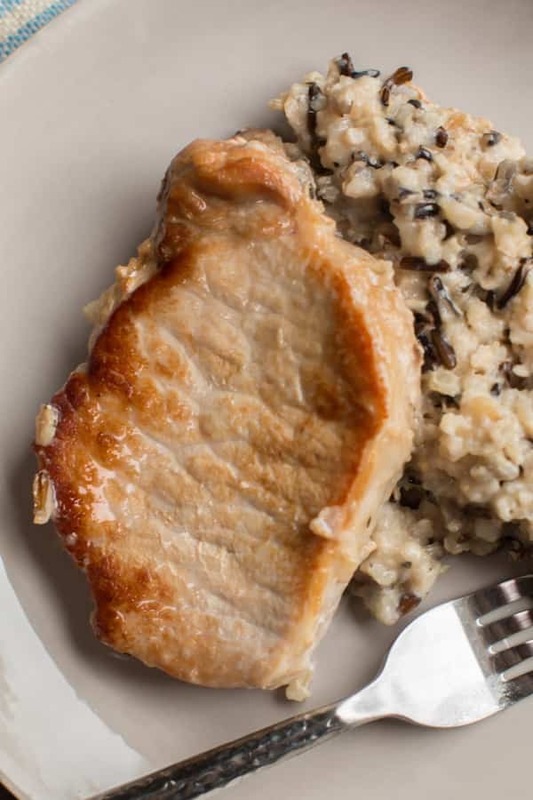 Though after I had made the recipe I looked at my box of wild rice and saw that it is from California, but I decided to not call this California pork chops, where ever you get your wild rice from this meal will be good. I didn’t change much from Norine’s recipe except I did used Minute® rice and wild rice instead of a rice blend. Minute rice always does well for me as does wild rice in the slow cooker. Did you know that wild rice isn’t actually rice it’s really a grain, no wonder there is such a texture difference. I really enjoyed the flavor of the mushrooms with the wild rice. The pork chops were very tender as well. Here is my YouTube video of the making of this meal. You can follow me on YouTube here. I hope you have a great weekend! 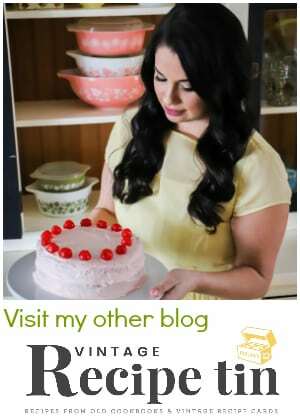 I will be back next week with more recipes. 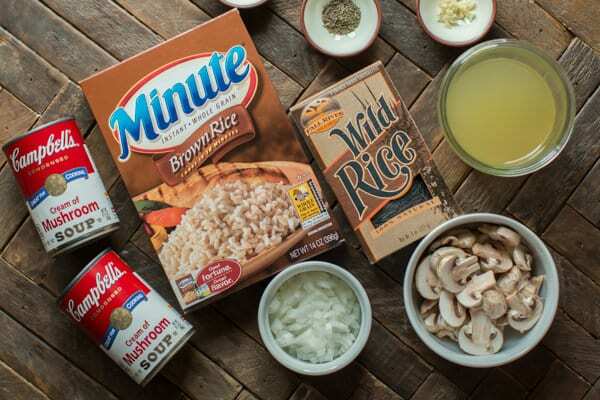 In a medium sized bowl mix together the cream of mushroom soup, chicken broth, mushrooms, onion, pepper, thyme, garlic, Minute® brown rice and wild rice. Place a skillet on the stove top over medium high heat. When the skillet is hot add the cooking oil, when the oil is hot brown the pork chops on both sides, don't worry about cooking through, just brown them. 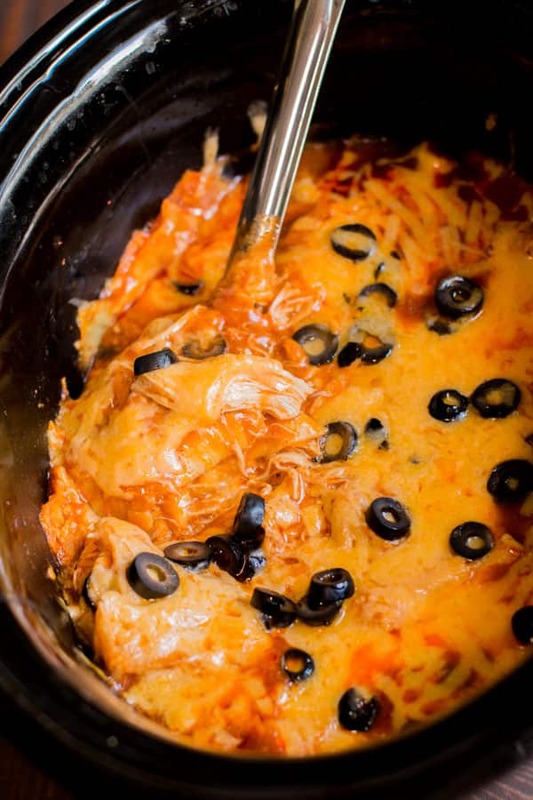 Spray the slow cooker with non-stick spray, add the rice mixture. Then lay over the browned pork chops. Cover and cook on HIGH for 3.5 hours. 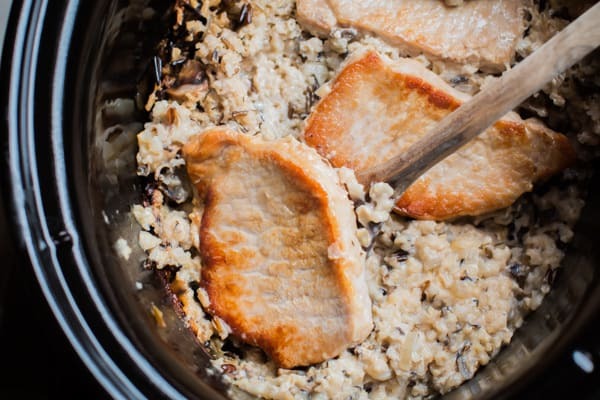 I’d try this, if I could use brown rice (not instant). Will the cook time change? Thanks. Regular rice does not do well for me in the slow cooker, it tends to get gummy. Do you think white rice would work? If it was minute rice. I have not had luck with regular rice in the crock pot. Could I use bone in pork chops? Would it be same cooking time? 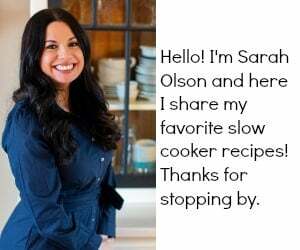 Hi Sarah, this is the first cooking site that I have come across that is dedicated to Slow Cooking. Yeah!!!! I love that you came up with the idea for this site. I am disabled and my husband has several heart problems, but gets around much better than I do. I have a motorized wheelchair, which really helps me get around some. I use to be in the kitchen cooking and baking, but now, I don’t do much. Just found the Crock Pot Liners, boy what a blessing they are! I can’t lift the crock out of the base and my husband shouldn’t be lifting it either. 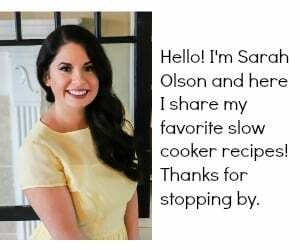 I have made 3 meals in the crock pot since the first of the month, which is amazing!!! Anyway, I would like to sign up for an email newsletter, if you have one. Would you please let me know if you do…or I’ll just go over to your web site once a week or so. Can it be cooked on low for 7hrs instead? We don’t call it casserole in Minnesota, we call it hot dish. Just an FYI 🙂 but it does look yummy! I made this for supper last night, and it was amazing! Leftovers for lunch today had the review of ‘this is right up there with hot beef’, you can’t get much higher than that in my house! Thank you for a simple, great tasting recipe that’ll be on regular rotation in this MN home.